The Yankees have been bad. Nobody is disputing that fact. Even by third-order winning percentage, which adjusts for run differential, underlying stats, and strength of schedule, the Bombers have been one of the worst teams in the American League in the first few weeks of the season. The despair and rending of garments has naturally followed, but one particular piece of handwringing doesn’t make a lot of sense to me. It involves Luis Severino. Severino’s most recent start against the Orioles was ugly: two home runs to a white-hot Mark Trumbo, a flubbed defensive play, and four runs surrendered in only six innings of work. All told, he’s rocking a 6.31 ERA across five starts in 25 2/3 innings, and his cFIP (a BP stat that is most predictive publicly available pitching metric) currently sits at 85, tied for 25th among pitches with at least 20 innings pitched this year. Yes, the Yankees defense has been terrible, but Severino’s DRA still sits at a horrendous 5.85, one of the worst in baseball. Yankees GM Brian Cashman even suggested that Severino could be sent down to AAA Scranton-Wilkes Barre to make the necessary adjustments. For the star pitching prospect in the Yankees farm system, things seem dire. Here’s a quick-and-dirty look at Severino’s underlying stats this year compared to both his numbers last year, and to this season’s league averages among starters. If you said these were the numbers of a 22-year-old prospect who was called up to the majors last August and had clocked five starts so far this year, I would tell you the guy was probably going to be fine. A sky-high BABIP paired with league-average exit velocity, better-than-average hard-hit rates, better-than-average production against him, and a laughably low left-on-base rate tells me this pitcher has been unlucky more than anything else in his first few outings. Throw in the great ground ball rate, and there’s no real cause for panic. But let’s add in another wrinkle to really drive this home. The Yankees have been one of the worst defensive teams in baseball. Whether you want to use Defensive Efficiency, its park-adjusted sibling, Defensive Runs Saved, or positionally adjusted Ultimate Zone Rating, the Yankees have been straight up bad with the gloves. It’s costing Severino outs, and are forcing in runs when Severino does make a mistake. It’s the same problem pitchers like Corey Kluber and Chris Sale had to deal with last year—despite electric stuff and sterling FIPs, the ERA looks garish thanks to the poor defense behind them. This is by no means an argument that Severino is perfect, mind you. He’s a 22-year-old starting pitcher with only 88 big league innings under his belt. He’s got a lot of learning to do. One red flag from 2016 so far is his strikeout rate. He’s preventing walks to the tune of only 4.3%, which is excellent, and much improved from his 8.6% figure last year. His strikeout rate, however, have plummeted from 22% last season to 13.8% this year, one of the worst in baseball among starters. Judging from his heat maps, it seems like he’s suppressing free passes because more balls are going over the plate and in play, which are also leading to fewer punchouts. Indeed, he’s allowing way more contact in 2016 than he did last season. Here are his pitch location rates for 2015 and 2016, starting with the former. It’s a clear miss. Brian McCann wanted that ball down, and instead it sails up. Mark Canha launched it 384 feet, coming more than 101 miles per hour off the bat. It’s not just his slider that he’s leaving up. He’s struggling to keep his four-seam fastball out of the danger zone. Here, McCann calls for the four-seamer on the outside edge, and it leaks over the plate for Mark Trumbo to annihilate to the left field stands. There’s a small theme to those two clips: Severino is facing right-handed batters in both of them. He posted a pretty standard platoon split for a righty pitcher last season, but so far, he’s weirdly got a reverse split going, striking out more lefties and giving up more power to righties. It’s early days, so that may just be a fluke, but it’s interesting. “Early days” is the operative phrase here. 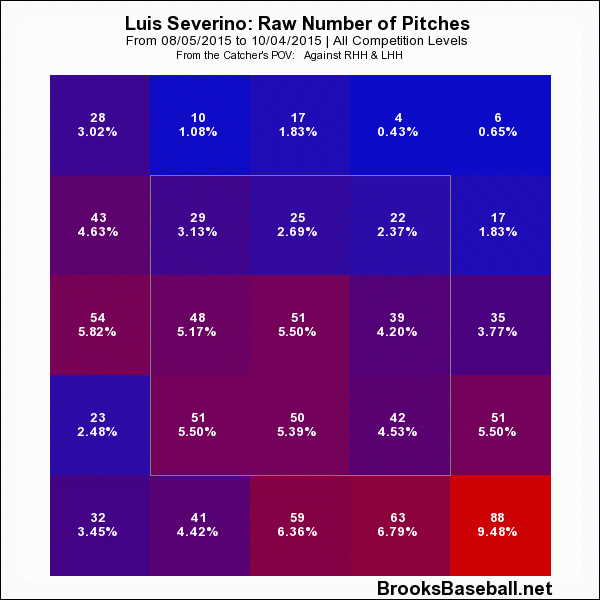 Is all of this data enough to demote Severino? For a 22-year-old with a 4.3% walk rate and only 10 extra-base hits surrendered against 116 batters faced, I should think not. There’s plenty Severino and pitching coach Larry Rothschild need to work on to wrangle his command. Severino is a young arm with a ton of potential. It would be unfair to deny him the chance to make adjustments against big league pitching, especially given the fact that his defense has let him down repeatedly. And if Severino were to be sent down, who takes his place? The Yankees aren’t exactly swimming in quality arms, especially considering that C.C. Sabathia has to go out there every five days and try not to throw the game away. Bringing Iván Nova out of the bullpen isn’t an upgrade. A trade this early in the season seems ludicrous, and the team is desperate to hold onto its prospects. There aren’t too many on the farm ready for the jump, either. Brady Lail might be the closest, but he’s walked 12 at AA Trenton so far this year, and could use more seasoning. 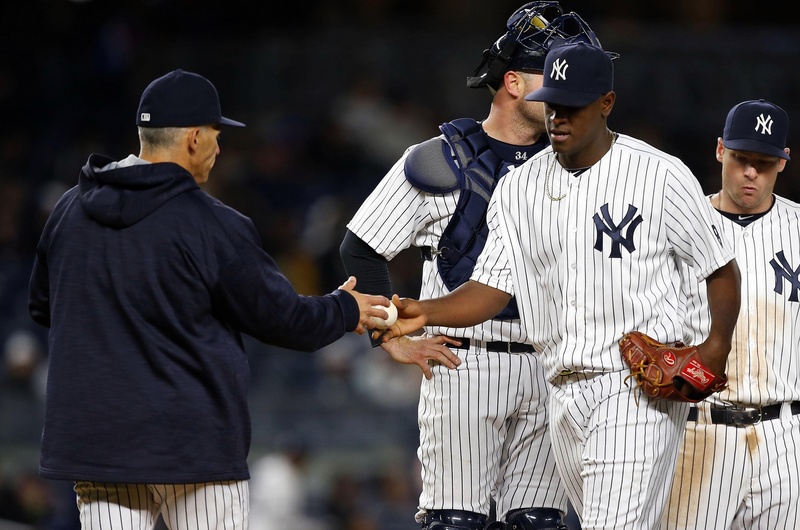 There’s a clear plan of attack for Luis Severino. If he can tighten up his command, keep the ball out of the fat part of the zone, and get his K rate up, he’s going to be fine. He’s proven that he can hang in the big leagues. Five starts shouldn’t make or break his development. It’s time for Cashman, Girardi and Rothschild to start trusting their young stud, and let him go to work. Evan Davis is a freelance sports journalist living in New York City. His work has appeared in FiveThirtyEight, SB Nation, Deadspin, and Howler. Follow him on Twitter and Instagram @ProfessorDobles.